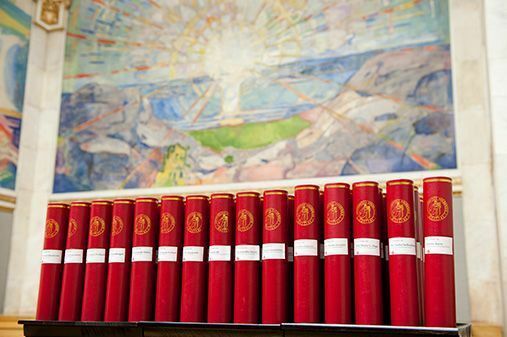 When your doctoral examination is approved by the faculty, you will be invited to a conferral ceremony in the University’s ceremonial hall, the Aula. You will receive the letter of invitation about five weeks before the ceremony. It is important that you remember to register by the deadline specified in the letter. It is, unfortunately, not possible to change the date of conferral, so if you are not able to attend, the diploma will be sent to you by registered mail. The ceremony in the Aula starts with a procession in which the university management and the deans take part. All of the candidates are given a reserved space in the front rows of the hall and placed according to their faculty affiliation. Guests may choose freely among the non-reserved seats. After the procession, the Rector holds a speech, before the deans of the respective faculties summon their candidates and present them briefly. The Rector then presents them with their doctoral diploma. A musical performance will be held during the ceremony. Finally, one of the newly conferred doctors will hold a speech addressed to the University on behalf of all the new doctors. The faculties take turns in choosing a speecher. The ceremony starts at 5pm and lasts around one and a half hours. Anyone may attend. The dress code is formal. Men should wear a dark-coloured suit and women should wear a dress, skirt and blouse, or trouser suit. The Norwegian national costume (the bunad) is also appropriate. After the ceremony in the Aula, a reception is held in the Domus Bibliotheca. This is an informal reception where tapas and wine are served. It lasts around an hour and you may invite up to six guests. After conferral, the doctors can buy a doctoral ring. The ring is 585/000 yellow gold, and delivery takes five weeks. The price is NOK 2,990 plus mva. The ring can be picked up at AvS design as, Breidablikkveien 10 G, 1167 Oslo or it can be sent COD, with a COD fee of NOK 164. Send and e-mail to order. Remember to give the ring size in mm.